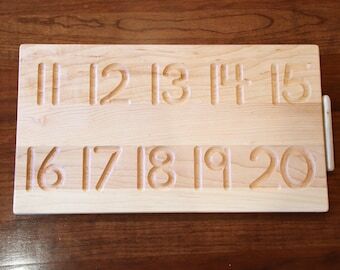 This is an original From Jennifer design that combines tracing and counting into a learning toy/tool for children! 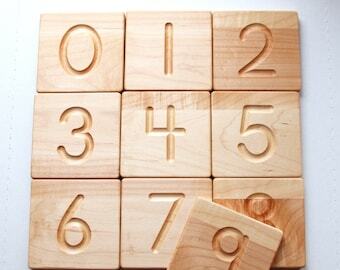 It will help your little ones learn how to form their numbers correctly and learn what each number represents. This is a maple hardwood board engraved with gently curved grooves, providing a form to trace with either your finger or the included tracing stick. We have three versions of this board available from the dropdown menu. Choose from Numbers Only, Counting Only, or Reversible Numbers and Counting. It measures 10.5x7.5-inches and is 1/2" thick. The "Counting Only" version comes with 60 1/2" wooden balls. Please keep in mind these can pose a choking hazard for young children, so we recommend using the balls with children only over the age of 3 years old. We did hear back from one customer that instead of using the balls, she put cherrios in their place. I'd even think it would be fun with raisins, chocolate chips, etc. 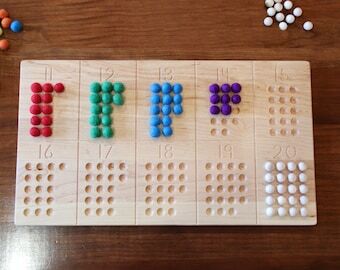 Many others have used beads, small stones, and even flower petals to fill the dimples and large tracing numbers of the board. 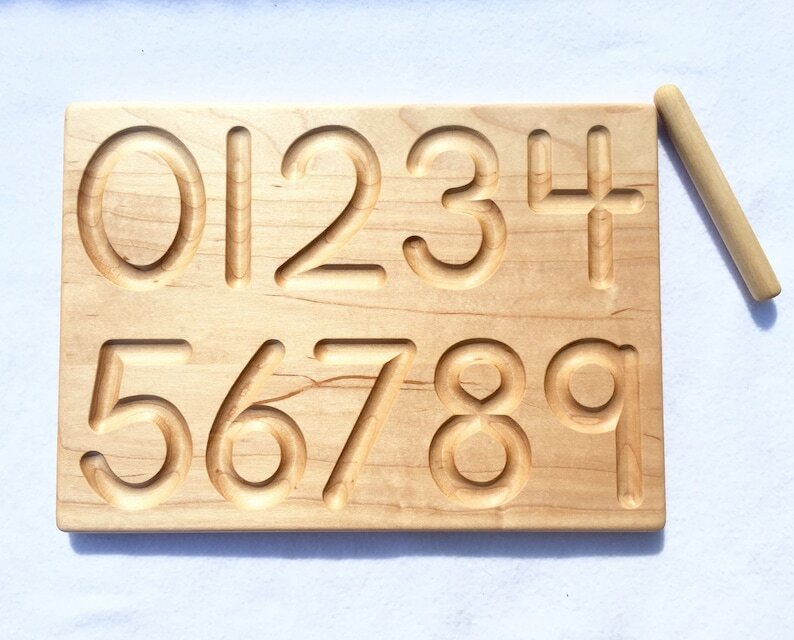 The "Tracing Only" option is the side of the board with large numbers and grooves that you will trace to feel the motion of writing each number. You may also enjoy doing crayon rubbings of the numbers or filling their grooves with the balls from the counting side (or other things such as beads, stones, etc). The "Reversible" option is a wonderful combination of both sides on one board. You simply flip it over to change sides. These are made to order and our general turn around time is two to three weeks--sometimes longer depending on current amount of orders we're processing. If ordering internationally, please be aware we will ship it first class mail, which is cheaper but does not come with insurance in the instance a package is lost or damaged. If wanting insurance on your package, please contact me for a custom listing. Also, some countries will add a Customs Fee before the package is delivered. This is additional to anything you pay for here in the shop and is a tax we cannot charge or calculate for you. Beautiful product, great quality, once shipped - arrived very quickly! Thank you so much! The board is beautiful and of great craftsmanship. The reason I’m giving 4 stars is I received my board in twice the time (almost 6 weeks) that was advertised (2-3 weeks). I ordered few things from Jennifer. It all arrived well packed and smelled so nice. The quality is superb! Fits in beautifully! We love all of our From Jennifer creations!